If you are an active woodworker you are likely giving your bandsaw a pretty good workout. It's a very valuable woodworking tool that couldn't cut a single thing if it weren't for the band saw blade that you use with it. We can solve all of your bandsaw blade problems thanks to our wide selection of Olson Bandsaw Blades. 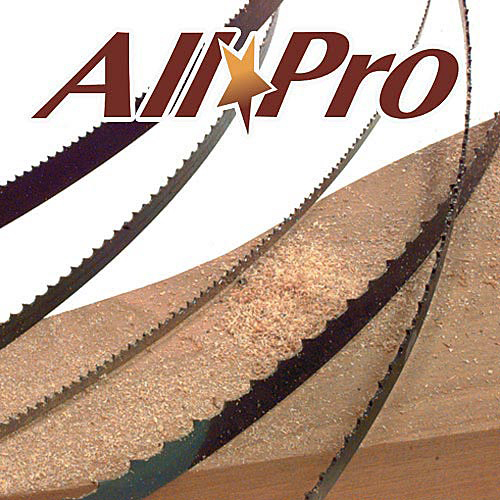 We offer both the standard Olson Bandsaw Blade line as well as a nice selection of their Olson All-Pro Bandsaw Blades. We offer a wide range of sizes and tooth types, giving you access to a lot of problem solvers for your shop! Find regular tooth, skip tooth and hook tooth bandsaw blades. Regular tooth bandsaw blades are the most commonly used general purpose tooth shape and give you the smoothest cut. Skip tooth bandsaw blades have widely spaced teeth for a more aggressive cut and are ideal for resawing. Hook tooth bandsaw blades really dig in and give you a faster cutting rate than skip tooth blades which makes them great for long cuts in thicker materials. Click the items below to take a closer look at our selection and let us know if you need something that you don't see. Buy 2+ Bandsaw Blades and save 10% on each. Bandsaw Blades 56-1/8" To 80"
Bandsaw Blades - 82" To 105"